Bobby Sox stares curiously at the camera at PAWS Chicago's Pippen Fasseas Adoption & Humane Center at 1997 N Clybourn Ave. in Chicago, IL. There are many more of her friends still available for adoption. 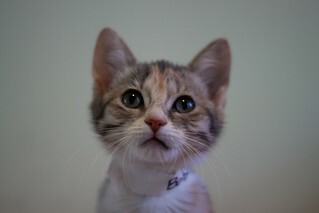 If you're interested in adopting a cat or dog, please visit www.pawschicago.org.